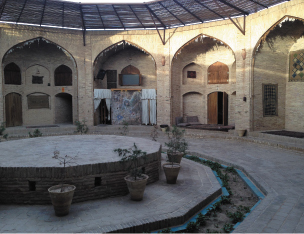 After crossing the desert our cab driver dropped us some 50 miles short of reaching Yazd, a provincial center, at the fortress like building where we were to spend the night-Caravanserai Zenoidin. 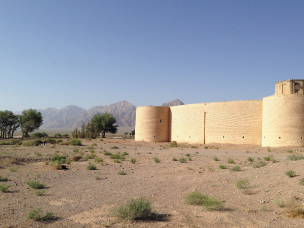 Caravanserai is not a hotel, it is an institution going back in the history when merchants traveling with their ware along the Silk Road needed a safe place to overnight with their camels. There were many, they say Shah Abbas built 290 in Persia alone. He also founded Persian Imperial Mail Service by building 1,999 Post Offices – with opening hours significantly longer than our Orinda Post Office. Maybe another case of Western superiority? We saw caravanserais before, one on the Silk Road in Armenia. 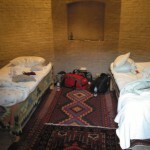 But this one is beautifully renovated, even if the beds in our room were uncompromisingly hard. 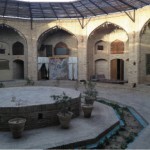 Most caravanserais are of a square shape. Zenoidin is an exception in being hexagonal with a shaded courtyard with all room doors leading to it. The comfort provided (regular complaint of our western spoiled „derrières“ noted) is remarkable. Caravanserai’s moderate nightly rate includes both dinner and breakfast, watching both sunset and sunrise on the roof with unlimited supply of chai any time anywhere within Caravanserai external walls. Moonlighting of the kitchen crew in the patio entertainment in music and dancing (with cooking apron sometimes removed) costs you 10,000 rials extra but you do not have to pay if your acting capabilities in pretending you sleep or got stomach problems disqualify you as a show participant. But be aware you consequently miss the cook’s performance as you have to spend the showtime either in your bedroom or in the above mentioned lavatory! For transportation between caravanserais there are few options available. With some exceptions, camels are not an option due to their shortage. Sanctions do have some impact. You can take a cab which comes in two basic varieties. First one is with air-condition and closed windows, the other one appealing to tough cookies and backpackers on a shoestring budget comes WITHOUT A/C but with open windows allowing unlimited access of hot desert air on your face and with your hair flying around so you can feel good as a real traveler. Even as you arrive to your overnight stop for all practical purposes partially mummified. As we fled Kerman in a hurry following mom’s dancing performance in the bazaar’s underground tea joint, you can guess our desert crossing cab was the non A/C variety. The next morning with enough time available we could afford calling for the driver/guide cab option with tainted CLOSED windows AND full blasting A/C pushing the temperature to a comfortable near freezing point. You will not be surprised that I can confirm that ANY country comes out on the scale of the tourist customer satisfaction as superior to those countries tourists observe in 120F heat through the open car windows! Even if that car is bigger!!!! Now let me give you a few observations on how the masses of Iranians for whom a $60 full day taxi ride across the desert may be unaffordable case of western luxury. They go by bus. If you, by any chance extrapolate the following lines as either comparison between Iranian bus service and United Airlines OR God forbid a criticism of a 4-hour United service between San Francisco and Chicago when this service might be on time, then be advised that your effort is very much misguided and absolutely unsupported by any facts. So, if you are an illiterate Iranian and you want to travel anywhere in Iran from a point A to a point B you buy a bus ticket. 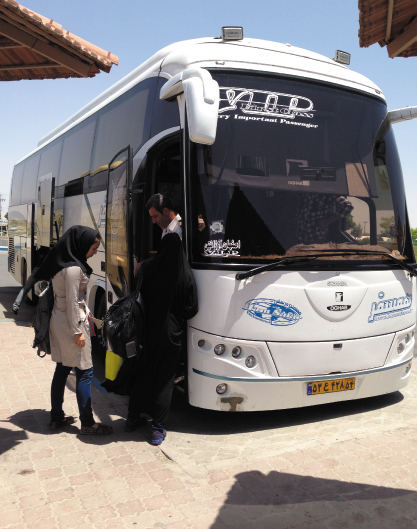 Since we decided to take a bus from Yazd to Isfahan, which takes about 4 hours, it sounds like a good case, because you spend about the same time on the bus as you would on the above mentioned SFO to ORD flight. This Iranian, as we did, would stop by in the travel agency next door. Here, they are still plentiful, just like those we may remember as mom&pap travel shops of the U.S. pre-Internet era. He would, as we did, get any bus ticket issued on the spot in a minute. I hope you understand I made this scenario just for comparison purposes. Otherwise average Iranian seems to be college educated so he/she being illiterate would be highly unlikely. Simply said, everybody can do this kind of travel planing without a computer. Don’t get me started on how much the ticket costs. Mr. Jeff Smisek, President, CEO, COO, CFO and Chairman of the Board of United Airlines, in his multiple leadership roles and a lawyer himself may get an idea for a libel lawsuit. 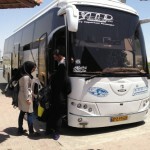 The advanced purchase, the last minute purchase, discounted tickets and similar marketing schemes seem to be still foreign to Iranian domestic bus market thanks to the Western sanctions. All tickets cost the same. Iranian people and Backpackers of the World United are deeply grateful to the U.S. Government for keeping those sanctions in place, and hopefully for many years to come, assuring the travel in Iran stays affordable. It looks like nobody in Iran screams „Death to America!“ anymore and this may be one of the good reasons. And what do you get for those $6 we paid for each of our tickets? Firstly, the shaded airconditioned environment with temperature being kept CONSTANT at about 20C throughout any trip no matter how long and no matter what temperature outside. Which in our case was hovering above 32C (90F, pleasant spring, right?). Surprisingly, nobody in the bus cockpit tries to make the boarding temperature of 90F more moderate and push it down to 45F by the time of reaching cruising altitude so passengers are uncontrollably shivering and sneezing by the time of landing at O’Hara. Secondly, the seating in the bus is arranged at 1+2 around the single aisle. This is very close to what United plans to introduce in the first class on selected domestic routes of at least 6 hours long by the end of fiscal year 2053. The seat pitch of our bus seats measured by my Keen sandals size 9 1/2 is about twice of those in United Economy Plus, the Gold Standard of our domestic airline industry. And I should not keep a secret from you that all seats on the long distance, so called „V.I.P.“ buses, have been partially lie-flat after Great Mullah of Teheran approved it, as long as sexes do not share arm rests! Thirdly, food service on Iranian busses does not include alcoholic drinks, since mullahs banned them long before United/Continental merger. You may remember that then Jeff Smisek, to improve customer satisfaction and to make Friendly Skies even Friendlier, started to charge for alcohol in Economy on overseas flights. Ayatollahs on the other side know well that average Iranian gets enough alcohol intake thanks to widespread moonshining in this society, so here I feel we are on par. Regarding the food quality; United stopped serving on flights shorter than 3 hours 59 minutes free pretzels, micro bags of peanuts, and similar luxuries long time ago so there is nothing to compare. Specially when on Iranian buses even in the Iranian Wild West called Baluchistan on Pakistani border, you get water, juice and generously sized box of a variety of cookies. And they do not wait with service until you switch all your electronic devices off. To give United a credit I would like to mention a rather sensitive issue of lavatories on this V.I.P. bus compared to the United aircrafts. This bus did NOT have any. 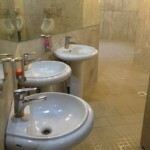 Many people may find it rather comfortable, as most Iranians do not drink excessively. For me, it constituted a serious problem, as it would on any flight longer than 29 minutes. Therefore I do find United lavatory service superior assuming that long standing issue of wiggling toilet seats on older aircrafts is going to be finally put at rest in the foreseeable future. 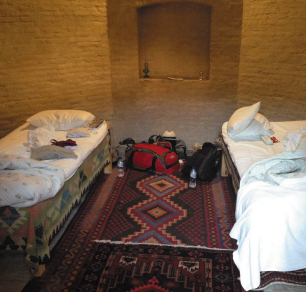 Ladies, we seem to be approaching Isfahan, our next stop for 3 nights. Regarding our wonderful time in Yazd, this will have to come with my next report.